There’s no doubt about it. Preparing for a trial can be an incredibly stressful experience. Thankfully, the Oahu bail bonds experts here at Wanna Get Out Bail Bonds are here to lend a helping hand! Dealing with an arrest is stressful enough, but when you contact our team, you’ll find that our free bond advice comes in helpful. We take pride in getting our clients out of jail fast. In other words, our number one mission is to get you or your loved one out from behind bars so you can get back to your normal life. Unfortunately, you’ll likely also have to deal with a trial. That can be stressful as well, but the good news is that there are healthy ways to keep yourself relaxed during the process. Whether you’re working with a local lawyer — which we strongly advise — or you are representing yourself, it’s important to have an outlet for your stress. That’s why we’ll be sharing a few great tips for how you can calm your body and your mind. Keep reading to learn more! One of the absolute best things you can do when you get stressed is to stay active. Whether that means going for a jog, playing basketball with friends, taking a walk around your neighborhood, or getting a membership at the gym, the more exercise you get, the better you’re likely to be. Numerous studies have shown that exercise greatly benefits you when you’re stressed because it provides you with a healthy outlet to let out some of your frustration. Whatever type of workout you prefer, you’re sure to see the benefits. A trip to the local library is a great answer for pretty much any problem. 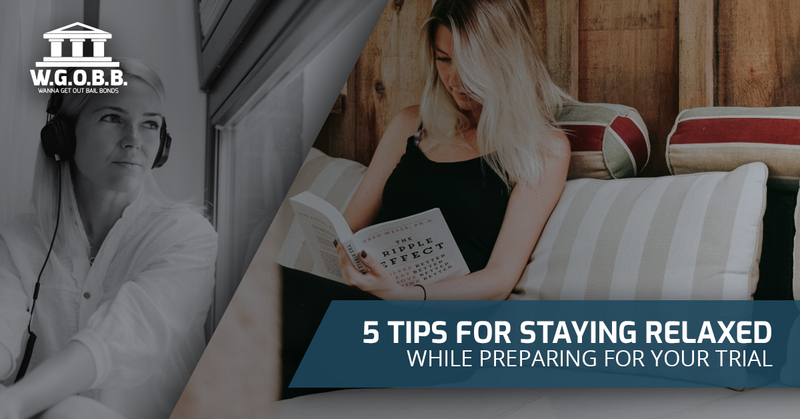 Sure, it’s hard to find time to read a book in your daily life already, but trust us when we say that finding the right book is a surefire way to occupy your brain. Not sure what to read? It’s hard to go wrong with Stephen King, James Patterson, Margaret Atwood, Ernest Hemingway, or Anne Rice. Or, of course, you can ask your local librarian for a suggestion. “But my new hobby should be preparing for the trial,” you might say. While it’s true that you should be speaking with your lawyer regularly to ensure you’re ready for your trial, the truth is that having a hobby outside of what stresses you out is the way to go. Whether it’s woodworking, painting, gardening, or something else entirely, having a relaxing hobby to turn to when you’re stressed can make all the difference in the world. One of the best solutions to any problem that life throws your way is spending some time at the beach. We’re fortunate to live on Oahu, and there’s no shortage of beautiful views to experience. Whether it’s Lanikai Beach, Kailua Beach, Waikiki Beach, or really pretty much any of the rest of the beaches on island, sometimes all it takes is the relaxing sights and sounds of the surf crashing, the people enjoying outdoor activities, and an amazing view to bring it all into focus. When is the last time you listened to music with the sole purpose of being actually listening to what’s happening in your earbuds? In this day and age, music is often seen as something to listen to while you’re doing something else. We have music on when we’re driving, working, or exercising. The truth is that it can be a much more enjoyable experience to actually listen to a new album with a fresh set of ears. The end result can be that you get to take in an album that you’ve loved for awhile in a whole new way, and that’s a really wonderful thing. Here’s the truth — no matter how relaxed you try to stay, there’s a good chance that you’ll experience some fear over your upcoming trial. Although we can’t predict the outcome, what we can do is let you know that we’ll be here to help. We strive to be the go-to bail bondsman, and over the years we’ve developed a reputation for being dependable, affordable, and trustworthy. In other words, you can count on us in your time of need. For many bond agencies, the help they give begins and ends when you need their services. That’s not how it works for us. Regardless of the situation that you’re in, we’re here to lend a helping hand. Take a look on the web for our reviews and you’ll see that that’s the honest truth. Are you in need of a bondsman? We’d love the opportunity to help. Contact us today.